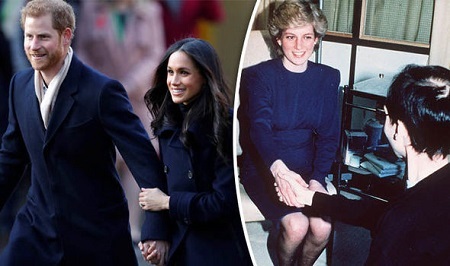 It was bitingly cold as Meghan Markle did her first walkabout, but she received the warmest of welcomes, chatting so easily with the people she met that many compared her to Harry’s late mother, Princess Diana . The prince and his fiancee arrived to whoops of “Meghan, Meghan” and she repaid their enthusiasm, reaching out, rubbing frozen hands warm between her own, and leaning in to catch the words of old and young alike. It would have been easy for the Suits actress to play to the cameras, but even to a cynical eye it was obvious this was no act. It was genuine . Yvonne Anderson, 54, was among the crowd, and said: “She showed real affection, she wasn’t stiff, and I loved that – we want to see the warmth. “I do think she could capture people’s hearts like Diana did.